The sprint finish of the second stage of Tirreno-Adriatico saw the unusual sight of World champion Thor Hushovd leading out Garmin-Cervélo teammate Tyler Farrar. The American sprinter won the stage, taking his third win of the season, and took the race leader’s jersey; the World champion, job done, drifted backwards as the other sprinters tried to get on terms with his teammate. After the stage Hushovd spoke to procycling.no about the two riders’ first ever sprint together as teammates. As one of the sport’s most consistent, albeit not the fastest, sprinters for the past decade, Hushovd has been more used to be the rider being led out, not the one leading out someone else. “It is clear that it was a little unusual,” he admitted. “But now the team has had a win, it is fun and easier to do. I knew I had one of the world's best sprinters behind me, so it was fun to help him to win. Hushovd and Farrar have now proved that they can work together, and to devastating effect, the World champion agrees that a number of other teams might well be a bit scared of Garmin-Cervélo in the sprints. Having been teammates for just over two months, and only having raced together once, at last month’s Omloop Het Nieuwsbald, the two sprinters seem to have developed an understanding inside a very short time. To see Hushovd working for another rider, instead of taking the sprint himself, was unusual in itself; to see the rainbow jersey leading out a teammate is almost unheard of. Thus far though, the World champion has only received positive feedback from his competition over the role he has taken at this race. In tomorrow’s stage Farrar will take the start wearing the pale blue race leader’s jersey; with another mostly flat parcours, and the last one ideally suited to the sprinters, the two Garmin-Cervélo riders might well find themselves in the same position again. 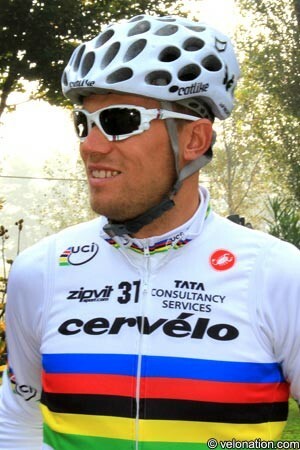 Whether Hushovd will pull over and allow his American teammate to sprint for the win though, has yet to be decided. “That, we will have to see…” he said cryptically. How long Hushovd, the World champion, is to remain happy to lead out Tyler Farrar remains to be seen. With Milano-Sanremo almost immediately following Tirreno-Adriatico though, it may go on a little longer as Farrar represents the best chance yet for an American winner. With the Norwegian’s stated target for the season in April’s Paris-Roubaix, he may be expecting some big-time cobbled payback very soon.